Cool colors like these have always had a way of catching my eye. And when it comes to mint... well, I think we all know how I feel about mint. Let's just say, mint has made it's way into my favorites for the season. And I hope you can see why? 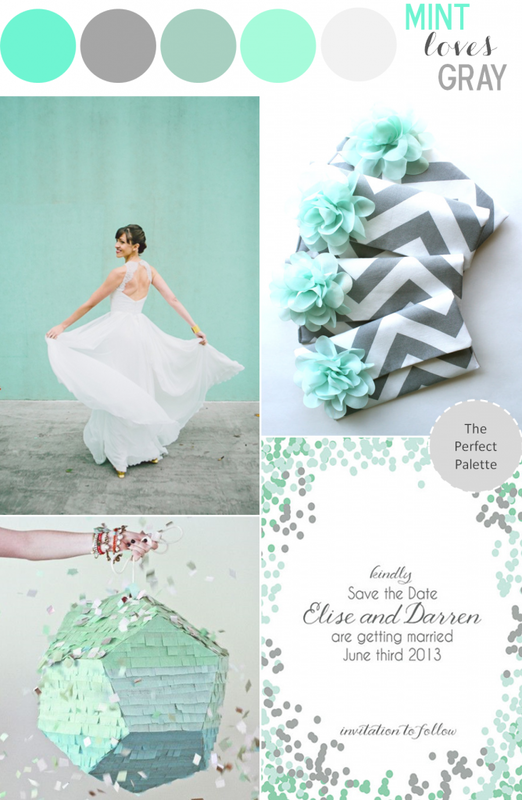 Shades of mint and gray were just made to go hand in hand! There's even a little grayed jade thrown into this mix. Fun, fresh and fabulous, these colors had me at hello! Looking for colors for your upcoming wedding or party? Well, have you considered mixing shades of mint and gray? If you're looking to create a modern and unique vibe, I suggest considering something like this. Because what's not to love? These chevron bridesmaid clutches by Allisa Jacobs easily incorporate the color palette right into your wedding day attire! And confetti inspired save the dates from charmed paperie create a fun and festive vibe. So what do you think? Are you liking this fun-filled color palette? And if so, tell me what other ideas you might incorporate to make it yours? 21 Comments " Color Story | Mint Loves Gray! " Beautiful and cool! I love that you've made one of our mutual favorites (mint) able to go right into fall and winter with this palette! Love, Love, Love these colors! so chic. And I love this palette! Very pretty. Mint is my new favorite color. Mint & gray are a perfect pair! That paper ball in the bottom left - LOVE! ooooo mint does love grey! i was just considering wearing mint jeans with a grey tee tomorrow, decision made! So pretty! And all the images you chose are just perfect!! I love this palette! To me, it seems like it could work for any season, too! Fabulous combination! Love these colors together and those clutches are perfect. Ha! I had decided a couple of days ago to use this exact palette for my bedroom (except with a tad of turquoise thrown in). I'm going to pin this for reference. Mint and grey really do look stellar together! I could see this being used for a beach wedding. Love the color combo! Love this color combo! What about adding coral for some warmth??? Great use of green. We do not see enough of this color scheme. It's very vibrant yet calm!